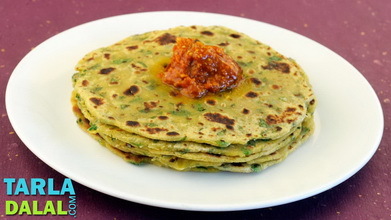 Theplas are an inherent part of Gujarati meals, and are used for regular meals, travelling and for picnics! 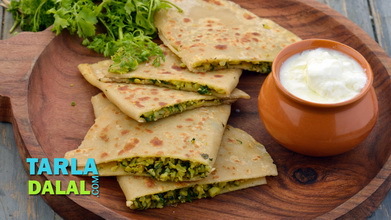 eaten with curds and chunda, theplas can be enjoyed hot or otherwise. 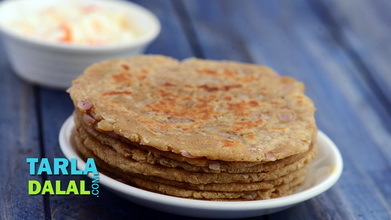 Sometimes whole jeera or til can be added to enhance the flavour of theplas. 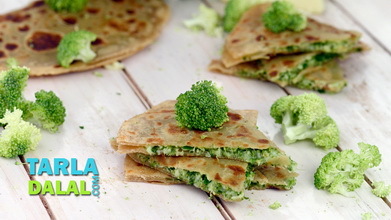 You can even add other ingredients like methi and doodhi to this recipe, to add more variety to your menu. 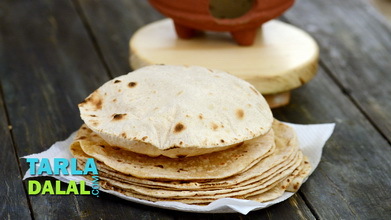 For making the famous gujarati thepla at home, you first have to combine whole wheat flour, oil, curds, turmeric powder, chili powder and salt in a bowl and knead into a semi-soft dough using enough water. 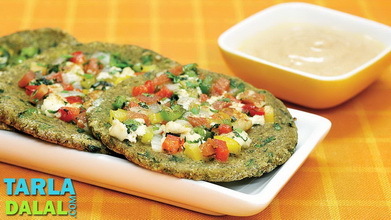 The addition of curd and oil in the dough results into soft thepla. Knead the dough well using a little oil. Cover with a lid or a muslin cloth and keep it aside for 10 minutes. Ensure that you are using a wide mouthed bowl which helps in kneading the dough without creating a mess. Divide the dough into 14 equal portions and shape them into round balls. 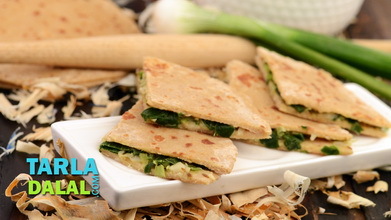 Press them gently between your palms and flatten it to roll out each portion into a 125 mm. (5") diameter circle using whole wheat flour for rolling. 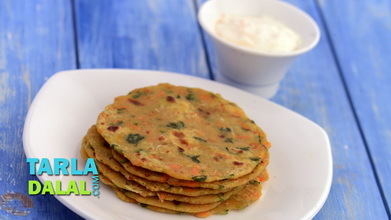 Serve the thepla recipe hot with chunda or sweet mango pickle.